Lucy is a standard chinchilla with a dark/extra dark coat depending on how the light hits her. 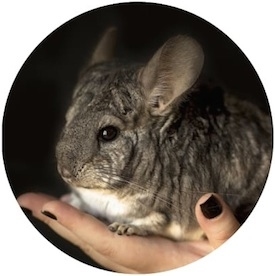 She is a extremely sociable chinchilla girl that is around 2 years of age and she adores a good head pet! Lucy is also extremely active and sometimes vocal lady and loves a good dust bath and run on her wheel. She is looking for someone who will be patient with her though, as she is very curious but she is still a bit hesitant to be picked up. Once she is safe in your arms she settles down quickly though and graciously accepts a treat and head pets. Won’t you consider giving Miss Lucy a fur-ever home?